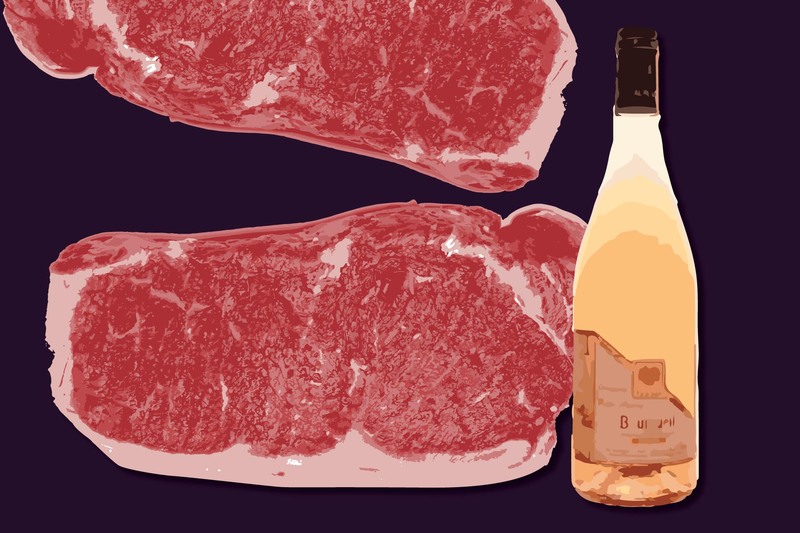 Put down the heavy reds and discover what you've been missing by learning how to pair seven cuts of steak with rosé. Nothing is quite like a perfectly grilled steak and a glass of wine. However, when the two are paired, we tend to default to the old “red wine with red meat” rule. The thought is that only red wine has the richness and texture to stand up to a steak’s robust flavors. But there are alternatives that can transform your steak pairing experience. More delicate than red wine yet bold in personality, rosé is one of wine’s most versatile performers. Often enjoyed during warmer months alongside lighter cuisine, many rosé lovers now savor it year-round with heartier dishes, including steak. Gaining its color from black and red grapes, rosé shares many characteristics with red wine. Its versatility rests in the robust varieties used, its place of origin and expert blending. 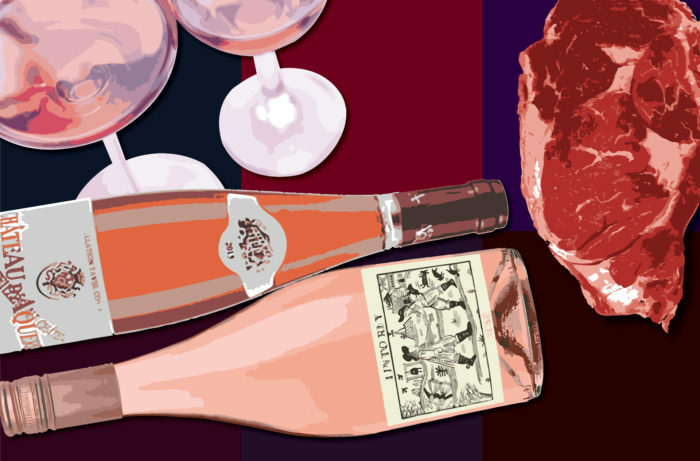 With an array of pink hues, fruity notes, spicy finishes, zesty tannins and degrees of richness, rosé can complement a steak well. 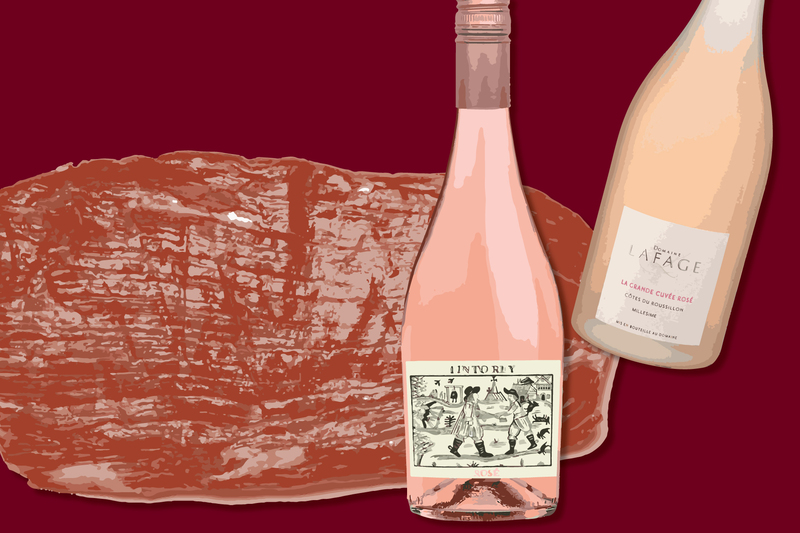 Below, accomplished sommeliers and wine experts around the country offer up their favorite rosé and steak pairings. Here’s the breakdown, cut-by-cut. Coming from the short loin of a steer, the New York strip is one of the most iconic cuts of steak. Loire Valley, one of France’s most diverse wine regions, produces exquisite rosés from the variety. Along with its red berry aroma, Cabernet Franc is also known for its distinct herbal notes. 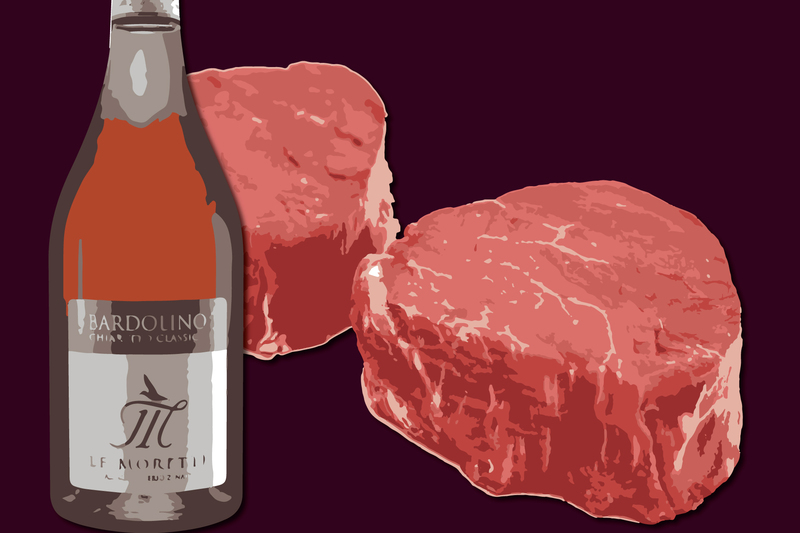 Medium-bodied and light on the palate, it possesses the tannin strength to pair well with a strip steak. Made entirely from Cabernet Franc, the Domaine de la Petite Mairie Bourgueil Rosé is a lovely option to get you started. A top sirloin is a cut that comes from the primal loin, or hindquarters, of the steer. “Low fat content yet firm texture make this a flavorful, full-on beefy steak,” says Eleanor Parker, manager of Atlanta’s Atlas Restaurant, which boasts an award-winning beverage program. She recommends a rosé with good acid, solid body and a lot of personality. “My pairing would be a rosé of Negroamaro from Puglia, Italy, which can be earthy, complex and masculine,” says Parker. Located in the southern region of Italy, Puglia is known for cultivating the Negroamaro grape, which produces bold, deep Italian red wines. Nicely structured, a Negroamaro rosé flaunts aromas of dark berries and licorice, and has a spicy, tannic finish. 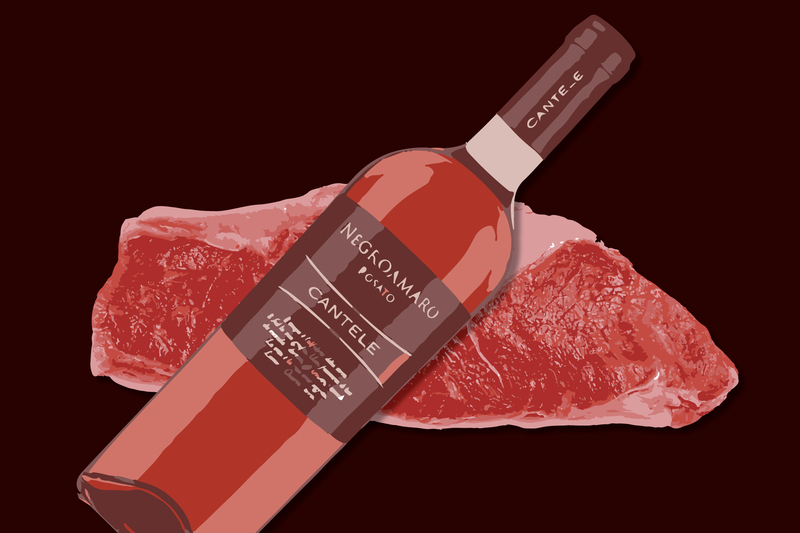 Cantele’s Negroamaro Rosato is a great top sirloin pairing. The flank steak comes from the lower abdominal muscles. Known for its bold red fruit and spiciness, Tempranillo is a black grape grown primarily in the Rioja region in Spain. Tempranillo rosés are commonly blended with Garnacha (known in France as Grenache). Grenache is dominant in most Southern Rhône wines, especially in the revered Châteauneuf-du-Pape Appellation d’Origine Contrôlée (AOC). A Grenache rosé is fruit-forward, floral on the nose and tends to be lighter on the palate with low tannins. A favorite among Tempranillo rosé drinkers is Tinto Rey Estate Rosé. For a more Grenache-forward option, La Grande Cuvée Rosé Domaine Lafage, from Côtes du Roussillon, is a solid pairing. Famous for its marbled fat that creates intense flavor, this steak is from the rib section, hence the name. It’s also one of the pricier beef options. The Tavel appellation is located in the Southern Rhône area of France. Said to be a favorite of Ernest Hemingway and King Louis XIV, it is one of the most renowned rosé appellations in Europe. Its bottlings are known for darker pink hues, earthy aromas and strong tannins. 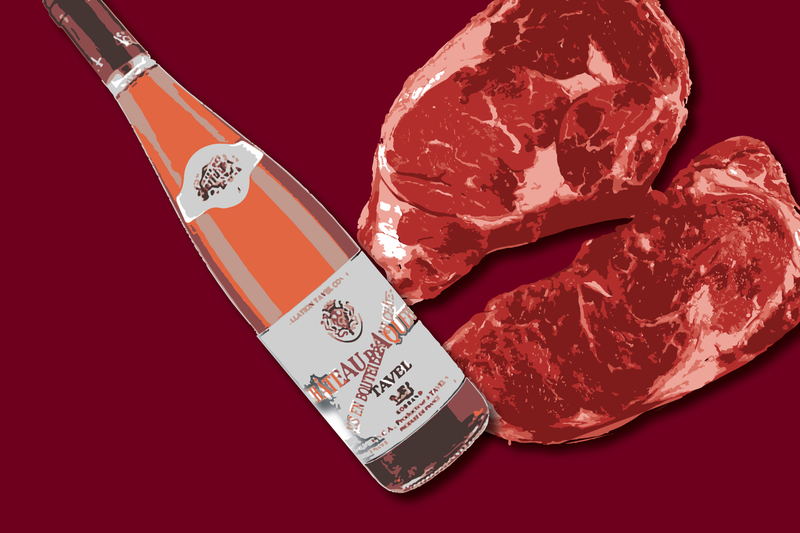 Parker’s recommendation for a rosé and ribeye pairing? “Château d’Aqueria would be perfect,” she says. Its distinctive texture and tenderness makes this a highly sought cut that comes from the smaller end of the tenderloin. When pairing wine with a filet mignon you’re looking for a selection that will not overwhelm the steak’s delicateness. The distinguished Bardolino Classico wine region is nestled on the southeastern shores of Lake Garda in northern Italy. Primarily blended with Corvina and Rondinella varieties, a Bardolino Classico is a dry wine with a delicate, fruity bouquet. Taken from the lower belly, the hanger steak is also a thinner cut, like flank. “Hanger steak preparations tend to be bit lighter,” says Schuster, who stresses the importance of taking the style of preparation into consideration when pairing. In the Provence region of southeast France, rosé accounts for more than half of the wine produced. The grape varieties found typically in a Provençal rosé are Grenache, Cinsault and Mourvèdre, usually blended. Provençal-style rosés are dry, have higher acidity, lighter shades of pink and more fruit-forward notes. 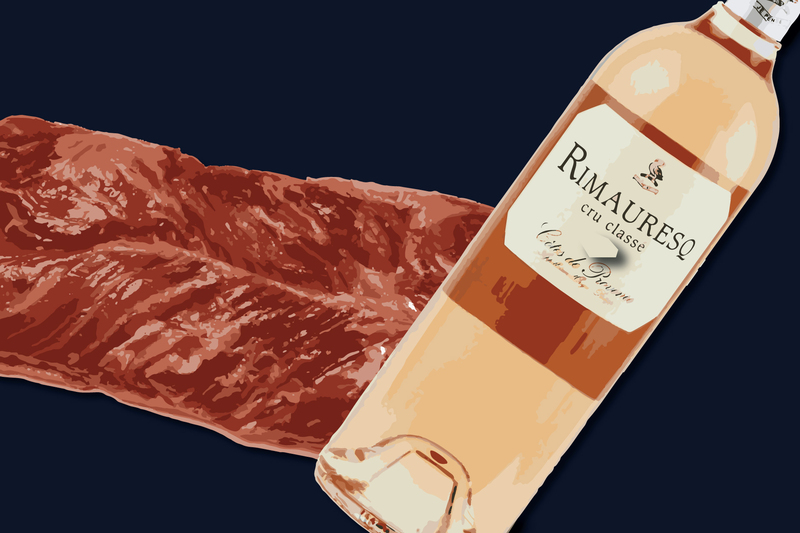 An elegant option is the Domaine de Rimauresq Côtes de Provence Cru Classé Rosé. Need a nudge in the right direction? 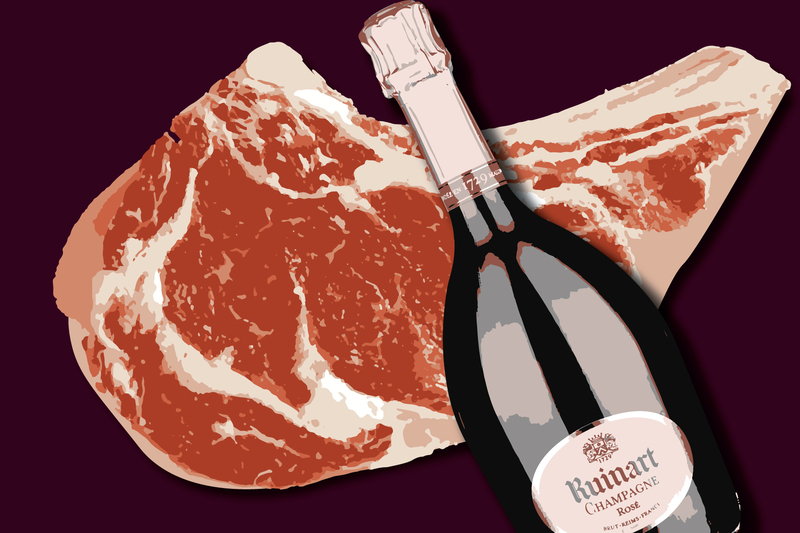 Produced predominantly with Pinot Noir grapes, Ruinart’s Brut Rosé is iconic because it’s produced by the oldest Champagne house in France.